Hello I have submitted my entry #34, Please check it out. I hope you will like it. For any queries mail me. How is it #15, Any suggestion? no oval outline. 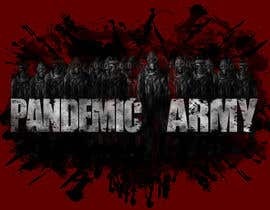 "Pandemic Army" in better font/style. I don't want the soldiers to be acual people, and also all of them straight forward. My description for the project will make it almost clear cut.